Tang Soo Do is a relatively modern martial art. However, its original basis, the Korean disciplines of Soo Bahk Ki and Tae Kyun, date back many centuries. Tang Soo Do (which means, way of the hand of the Tang Dynasty) is a composite style influenced by the traditional Korean martial art of Soo Bahk Do, Northern and Southern Chinese martial arts systems, and the Okinawan discipline of Karate. The Chinese influences were Basic Training (Seh Bop - method of postures, Bo Bop - method of steps, Ryun Bop - method of conditioning), and form and combat applications (Dhan Toi Sip E Ro, and the "Tae Kuk Kwon"). The Okinawan influences occurred primarily during the Japanese occupation of Korea (1910-1945). The name Tang Soo Do was the term Grandmaster Won Kuk Lee, founder of the Chung Do Kwan, originally applied to his martial art. 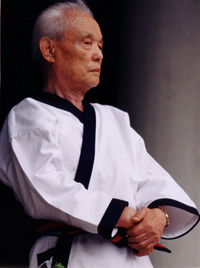 After meeting with Grandmaster Lee in 1947, Kwan Jang Nim Hwang Kee, founder of the Moo Duk Kwan, decided to integrate the name Tang Soo Do into his Hwa Soo Do discipline. Tang Soo Do kicking techniques are based on the ancient Korean style of Tae Kyun, which was later formalized by Grandmaster Hwang Kee, founder of the Korean Soo Bahk Do (Tang Soo Do) Moo Duk Kwan Association (formerly named Hwa Soo Do Moo Duk Kwan). Tang Soo Do is both a hard and soft style, deriving its hardness in part from Okinawan Karate and its soft flowing movements from Soo Bahk and also Northern and Southern Chinese martial arts. Although Tang Soo Do, and its tremendous combative martial arts applications, can be adapted to competition, "it is not a sport". As both a traditional and classical martial art, its primary focus is to develop the physical, mental, and spiritual aspects of the human being. Its primary purpose is on positive and enhanced character development, and the rejuvenation and prolonging of life. This integration of mind, body, and spirit helps to create a person free from inner conflict who is able to deal with the outside world with integrity in a mature, forthright, intelligent, and virtuous manner. Tang Soo Do is the technical art and the Tang Soo Do Martial Way Association an administrative, educational and philosophical organization. Grandmaster Andy Ah Po founded the Tang Soo Do Martial Way Association, Inc. (formerly the Tang Soo Do Moo Do Kwan Association, Inc.) in January 2002, after 43 years as a member of the Korean Soo Bahk Do (Tang Soo Do) Moo Duk Kwan Association in order to preserve and continue the original teachings, concepts and philosophy of his Tang Soo Do mentor Kwan Jang Nim Hwang Kee. He is committed and dedicated to promoting Tang Soo Do worldwide and to preserving the standards of excellence, as originally established by the late Great Grandmaster Hwang Kee. Grandmaster Ah Po was also a Founding and Charter Member of the United States Soo Bahk Do Moo Duk Kwan Federation, Inc., where he served as an appointed member of the Board of Directors, and also as a Regional Examiner and member of the Technical Advisory Committee for over 27 years.